Digital Asset Management (DAM) refers to the group of management decisions and tasks that surround the process of annotating, ingesting, cataloguing, retrieving, storing and distributing digital assets including digital photographs, music, videos and animations. The DAM process requires you to use systems including computer hardware and software systems. Digital Asset Management is also said to refer to the protocol used for backing up, rating, renaming, downloading, optimizing, archiving, grouping, exporting and thinning files. DAM is a somewhat complex process so it is advisable for you to get your Digital Asset Management certification if you are serious about becoming an expert in this field. This will make it easier for you to perform all your functions and responsibilities as a DAM expert. Deciding to get a Digital Asset Management certification requires you to improve your skills in effectively storing digital assets including stock photos, presentations, audio, video and product images. Any useful file which is on a drive is considered as a digital asset and you need to store this in a secure and accessible format like Excel, Word, PowerPoint, Quark, Illustrator, PDF, In-Design, PageMaker and Auto CAD. You also need to improve your skills in administering and controlling digital asset or files. Proper management of digital assets requires skills in effectively regulating new digital assets influx, editing and assigning metadata linked to each digital asset and linking all these digital assets to users with permissions that are based on roles. You also need to become aware of the different systems used in DAM in order for you to become successful in the field. If you are serious about receiving your digital asset management certification, then the program offered by Brainmeasures related to this field is highly recommended for you. Brainmeasures is the most recommended online certification and testing company because of the effectiveness, authenticity and comprehensiveness of all its programs. This means that deciding to take up your digital asset management certification course from this company is a major help in your attempt to receive the most detailed digital asset management training. The DAM certification program from Brainmeasures will require you to take and pass its related test in the end before you finally receive your certificate. 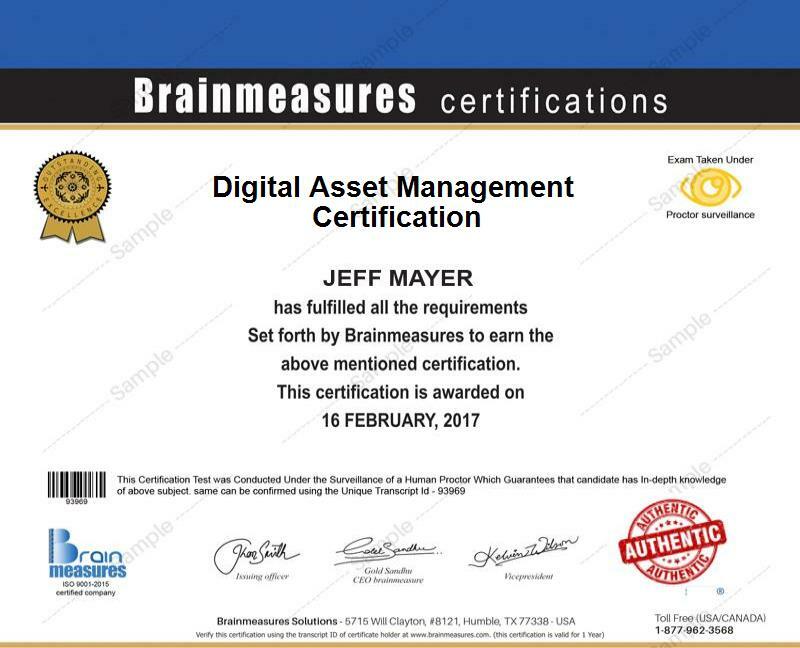 The digital asset management certification program from Brainmeasures aims to help business owners and their employees in effectively handling all their digital assets. This is an ideal course for aspiring digital asset managers, for database administrators and developers and for professionals who are tasked to manage, control and protect all the digital assets of an organization. Being a digital asset management certification holder also allows you to enjoy great monetary rewards since you can start earning around $73,000 to $108,000 per year.